France – Formula One world champions past and present paid their respects to Jules Bianchi and mourned one of their own at the French driver’s funeral on Tuesday. Lewis Hamilton, the current champion for Mercedes, attended the service at Nice’s Sainte-Reparate cathedral along with former champions Alain Prost, Jenson Button and Sebastian Vettel. Bianchi, 25, died in a Nice hospital on Friday after suffering critical head injuries when he skidded off the track and hit a recovery tractor in last October’s Japanese Grand Prix. He was the sport’s first driver fatality as the result of race injuries since Brazilian triple world champion Ayrton Senna and Austrian Roland Ratzenberger died at the San Marino Grand Prix at Imola in 1994. 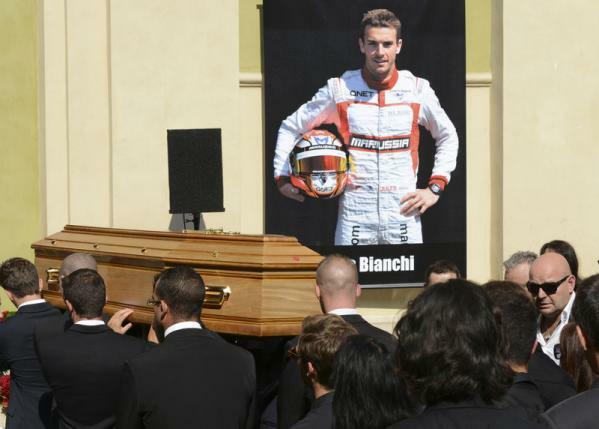 French media said parish priest Sylvain Brison told the congregation that, while Bianchi’s death was “profoundly unjust”, the driver had been “happy because he had made his dream come true. Friend and compatriot Jean-Eric Vergne, the former Toro Rosso racer and current Ferrari test driver, said Bianchi was “an extraordinary man, as beautiful inside and outside and now he is in heaven with F1’s biggest names. Bianchi had made his Formula One debut with Ferrari-powered Marussia in 2013, scoring that team’s first and to date only points in Monaco last year when he finished ninth. Formula One’s governing body, the FIA whose French president Jean Todt attended the funeral, announced on Monday that Bianchi’s chosen number 17 would be retired from the world championship. “Formula One is a complicated job… but he always remained humble, nice with everybody,” said Todt’s son Nicolas, Bianchi’s manager, outside the cathedral.